Dotted around the Walt Disney World resort, in amongst the hustle and bustle of ride and lines, and shopping, and crowds moving to and fro are some very special places. They are perfect little spots to sit down and take 5 minutes for yourself, to be in the moment and soak it all in. You'll find one such 5 minute spot located down below Cinderella Castle on the pathway to Tomorrowland, off to the side sits a charming little alcove that's home to a wishing well. This out of the way spot is rarely crowded and a perfect place to take a break and relax for a few minutes. A few wrought iron benches offer a spot for weary grown ups to have a seat amongst the potted and manicured garden. It's one of those charming spots that for a few minutes you can escape the bustling crowds. The wishing well provides a great photo opportunity for all sorts of lovely memories for children and adults alike. While you're there posing, don't forget to toss in a coin or two and make a wish. While Snow White's wishing well in Disneyland is rustic and rough hewn, in sharp contrast the well that belongs to Cinderella was obviously created after she married her Prince. The intricately crafted sides offer reliefs of her adorable mice and bird friends. It depicts them in the act of gathering supplies to make her ball gown, while the wiley Lucifer stalks them around the side. 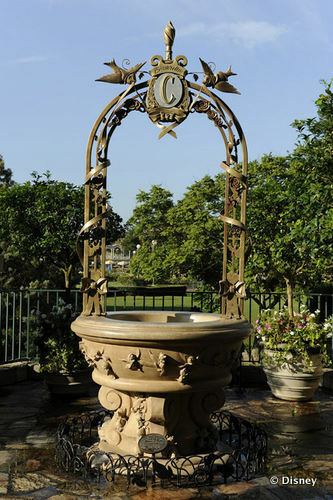 The intricate basin was designed and sculpted by Disney Legend Blaine Gibson. 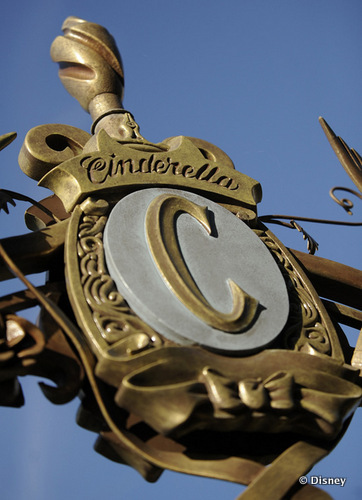 It's an enchanting detail that captures the regal elegance of the Cinderella story. The money from Cinderella Wishing Well is collected regularly and donated to a variety of children's charities. Have you made a wish in Cinderella's Wishing Well? Has it come true? Leave a comment and let me know what you're wishing for. My wife and I love this spot. Can't wait to show our kids. I proposed to my wife at the at the Wishing Well. My husband planned a surprise for me and had all of our friends take turns throwing a quarter in to make a wish and when it was my turn, I threw my quarter in, and turned around to find my "now" husband on one knee with a glass slipper with a diamond ring resting on it waiting to propose--he asked if I would make all of his wishes come through and be his wife. Wishes do come true! Awww... what a great story Michelle! Thanks for sharing it with us! And now for a story to somewhat ruin these, when I was waiting in line to see Rapunzel near here, I saw a rat come out from the bushses and wait next to the well. I got some laughs by saying, "Hey, it's Mickey." Thankfully it was far enough away to prevent anyone from freaking out.